When Jack Blakey was studying theatre at Notre Dame in the 1980s, he never dreamed he would one day be hearing legal disputes on the federal bench. But his liberal arts courses were preparing him for it nonetheless. Blakey B.A. ’88 J.D. 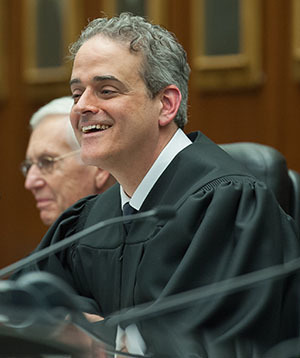 ’92 was formally installed this spring as a judge of the U.S. District Court for the Northern District of Illinois, following his nomination by President Barack Obama and confirmation by the U.S. Senate last year. The son of G. Robert Blakey—the William J. and Dorothy K. O’Neill Professor of Law Emeritus at Notre Dame Law School—Jack Blakey spent much of his legal career as a prosecutor, first as an assistant U.S. attorney in Miami and Chicago, then as an assistant state’s attorney in Cook County, where he rose to chief of the special prosecutions bureau. Now on the federal bench in Chicago, Blakey’s docket includes a diverse set of about 300 civil disputes, and he began taking on criminal cases this summer. While his theatre and communications courses in the College of Arts and Letters may not have covered the ins and outs of federal law, they did instill many abilities he’s drawn upon regularly over his 23-year legal career. He learned how to argue and compromise. How to listen and understand. How to empathize and analyze. During his undergraduate career, Blakey acted in three or four plays per year at Notre Dame—including the title role in King Lear—then attended the London Academy of Music and Dramatic Art. He soon felt called to serve the public through the law, and the transition from stage to court was a natural one. Blakey’s time at Notre Dame shaped him personally as well as academically. The Catholic character that is central to life on campus, he said, has been a guiding force throughout his career. Originally published by Josh Weinhold at al.nd.edu on June 29, 2015.